Les Merveilles, Font de Leu and Sainte Modeste. 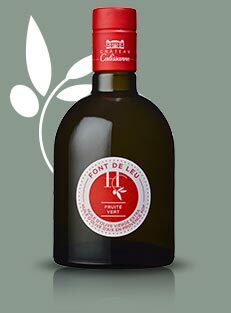 • Fruité Vert, an oil with a fresh herbaceous taste and notes of artichoke and tomato leaves. At Calissanne we pay great to care to our oils’ balance, blending varieties to obtain a Fruité Vert oil of appealing intensity but not too peppery. The olives are picked and pressed within 24 hours to avoid any oxidation and retain their natural fruitiness. • Olive Maturé, an oil that gives off aromas of walnuts, truffle and undergrowth. . The crop is harvested late, and stored in a dark, airtight location for 4-5 days at 30°C. Fermentation tempers the fruit’s natural pepperiness, and develops its typical notes of matured mellowness. At the foot of the hills of Lançon-Provence, facing Estaque, our 60 hectares of AOC Aix-en-Provence olive trees look towards the Montagne Sainte Victoire. The five south-facing olive groves are planted in limestone scree soils, in a warm dry terroir particularly appreciated by this tree – the very symbol of Mediterranean civilisation. Our olive groves are traditional plantations, i.e. they are well spaced, so there is little competition between their roots, and the trees flourish. We have 100 trees per hectare at Calissanne, compared with the French average of 350. This low density ensures high soil vitality. Also, pollination rates are excellent, helping ensure large quantites are produced. Aglandau, Salonenque, Pitchouline (10%), Grossanne, Calcutière. We cultivate our olive trees using the Nutrition Méditerranéenne en Provence standard: a specification based on varietal selections and growing methods that let us protect and grow our crops in ways that nutritionally enhance the olives and oils, while preserving the environment. Fore more than five years, Calissanne has been farming its vines and olive trees to meet environmental requirements and expectations. Compliance with this label is checked by Bureau Véritas. 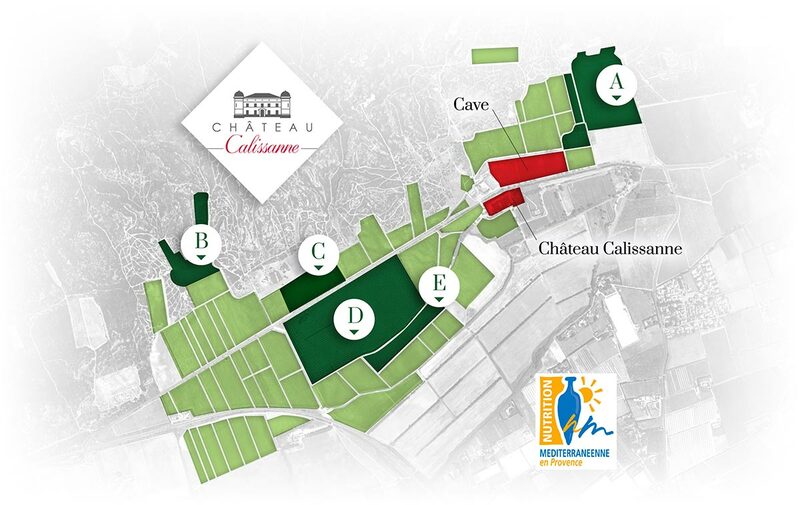 The two main varieties grown at Calissanne are traditional in the Aix area: Aglandau and Salonenque. A southern French olive variety thus named because it looks similar to an acorn – gland in French. 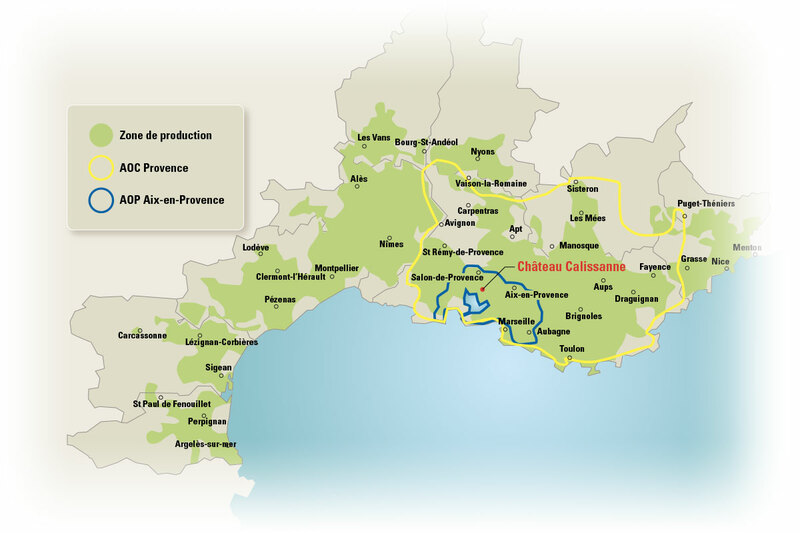 Aglandau is also known as “verdale” in Carpentras, Berruguette, Blanquette or Plant d’Aix, depending on the region! This variety accounts for about 20% of French olive-oil production, and 60% on our estate. It has ample flesh, and is a dual-purpose variety, suitable for oil and the table. This variety is characterised by its fruitiness and rich texture. The Salonenque olive originated in Salon-de-Provence. It is grown mainly in Provence, where it thrives. At Calissanne, it accounts for about 40% of production. This variety alo goes by the names of Plant de Salon, Salonen, Sauren and Varagen. Its distinctive features? A fairly mild Fruité Vert style, with artichoke, hazelnut and green apple the dominant notes. It is particularly suited to the production of oil and of split olives for the table. The olives are harvested in nets placed on the ground, between the rows of trees. The olives are combed off the trees. We harvest each variety when optimally ripe. Harvesting takes two months, from mid-October to mid-December. The olives are taken straight to the mill and crushed the same day, to extract their juice and preserve their fruitiness. It takes 5 kg of olives to make 1 litre of oil. 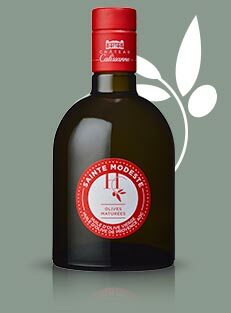 The only oils able to lay claim to the “Huile d‘olive de Provence” Appellation d‘Origine Contrôlée? followed or not by the wording “matured olives”, are those that meet the conditions set out in the present decree. 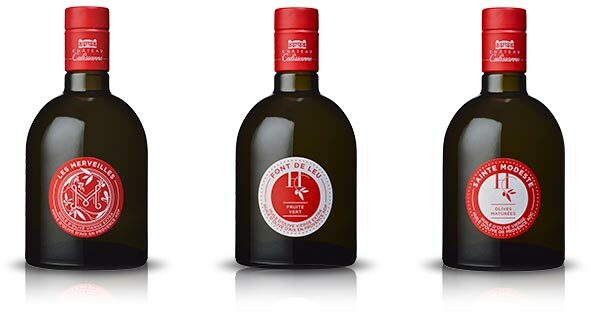 The “Olive Oil of Provence” is characterised by a low-intensity nose of red berry fruits, herbaceous and raw-artichoke scents able to be associated with almond milk and cinnamon. On the palate, the oil has an intense fruitiness, characterised by herbaceous and raw-artichoke notes, perhaps supplemented by aromas of banana, hazelnut, fresh almonds and tomato leaves. There may be some pungency on the finish. 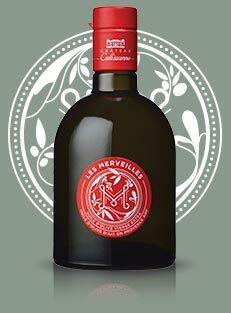 The olive oil of Aix-en-Provence has a nose characterised by fresh grass, raw artichoke and occasional vanilla notes. The fresh grass and/or raw artichoke are also present on the palate, sometimes supplemented by notes of walnut, fresh hazelnuts and red berry fruits. It may have a peppery edge on the finish. Before first marketing, its pungency (termed “pepperiness”, within the meaning of the present specification) and bitterness vary from 1 to 5 on the organoleptic scale of the International Olive Council (COI) in the first four months after crushing, then gradually falls, rating between 1 and 3 at the end of this period. Made since ancient times, olive oil is an excellent way to help eat a balanced diet. It can be enjoyed raw, to retain all of its nutritional properties, and is very good for cooking. Together with cereals and wine, it is part of the famous “Mediterranean trilogy”. There is something most intimate, and immensely old, about the murmur of an olive grove. Extract from a letter by Vincent van Gogh to his brother Théo, 29 April 1889, published by Editions Grasset. In 15,000 BC, Crete had established the quality of a food-grade oil “which did not smell strong” and could thus be used for purposes other than lighting or bodycare, as an unguent or balm. When they founded Marseille, the Phocaean Greeks imported to western Europe the cultivation of olive trees: soil care, harvesting and oil-extraction methods. The quantity of amphoras found by archaeologists reflects the growth in the oil trade, from which the central authority in Rome received substantial tax revenue. The health benefits of olives and their oil are of great interest, owing to research findings that demonstrate a low incidence of heart disease and certain cancers in countries with Mediterranean-type diets. Olives, and primarily olive oil, are an integral part of this diet. Olive oil is a source of vitamin K. This is essential for making proteins that both help stimulate and inhibit blood coagulation. It also plays a role in bone formation. Besides being found in food, vitamin K is made by gut bacteria – which is why deficiency in this vitamin is rare. Olive oil is a source of vitamin E. Levels of vitamin E are typically higher in first cold pressed oils (such as Calissanne’s!) than in refined oils. A key antioxidant, vitamin E protects the membrane the surrounds the body’s cells, and particularly the red blood cells and white blood cells (the latter being immune-system cells).